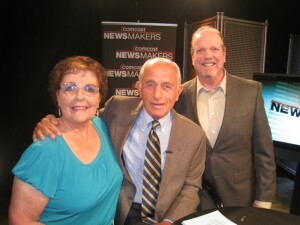 On Wednesday July 8, 2009, Michael and Jean-Marie were invited back for another television appearance for “Through My Mother’s Eyes.” They will be featured once again on Comcast Newsmakers of Northern California, a five-minute news interview program that will run along CNN Headline News. The segment was hosted by Jack Hanson, formerly with KGO Channel 7 in San Francisco and aired daily through the month of August 2009. Jean-Marie, Jack Hanson, and Michael, on the set of their taping with Comcast Newsmakers.